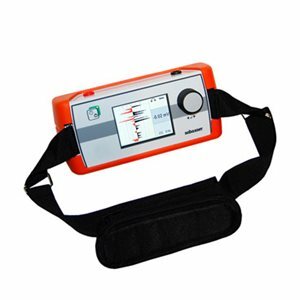 The earth fault locator ESG NT is used to pinpointing cable sheath faults with great accuracy. Using a bright, sun readable TFT color display makes it very easy use. The displayis by a bargraph, similar to the analogue display or by a history display, which shows the deflections of the last 7 pulses. A fully automatic calibration keeps the display always at zero and the integrated noise suppression eliminates all influences by DC, Railway currents, industrial plants and high resistive soil environment. By two earth rods, the ground step voltage potential is measured and the direction towards the fault is indicated by the display. The ESG NT is also available as combination set with the digiPHONE+ in one unit.